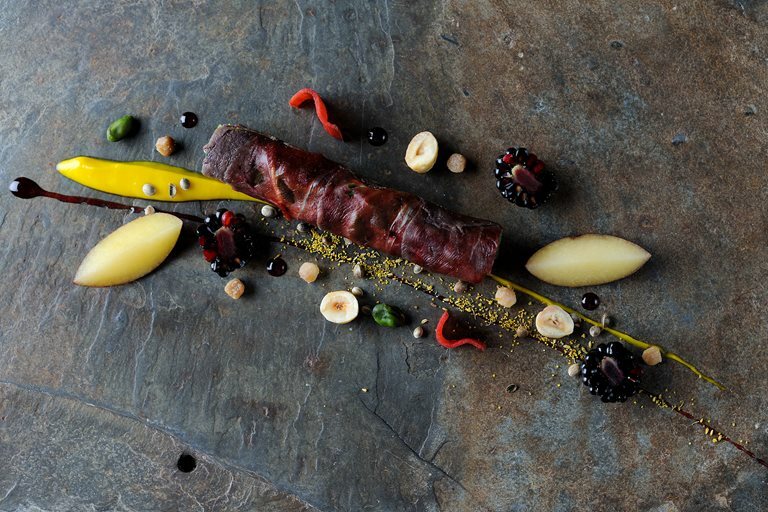 This imaginative pigeon recipe from Chris Horridge uses a simple curing process to add an intense citrus flavour to the bird. This inspirational recipe, uses a remarkable method to cure the pigeon breasts that will make a stunning addition to a dinner party. You can buy the birch wine required in this recipe online and from specialty retailers. For the citrus purée put the zest of the lemons and oranges in 1 litre of cold water and boil for 10 minutes. Drain and repeat this process 3 times until the zest is tender and most of the bitterness has gone. Chris Horridge is a master of balancing unusual flavours to great effect, working at various Michelin-starred restaurants around the country and earning his own star for his kitchen garden-driven food. He is a passionate advocate of nutritious, ‘free from’ food, choosing and pairing ingredients based on their effect on the body as much as flavour.